Pomegranate (Punica granatum): growing, planting, caring. 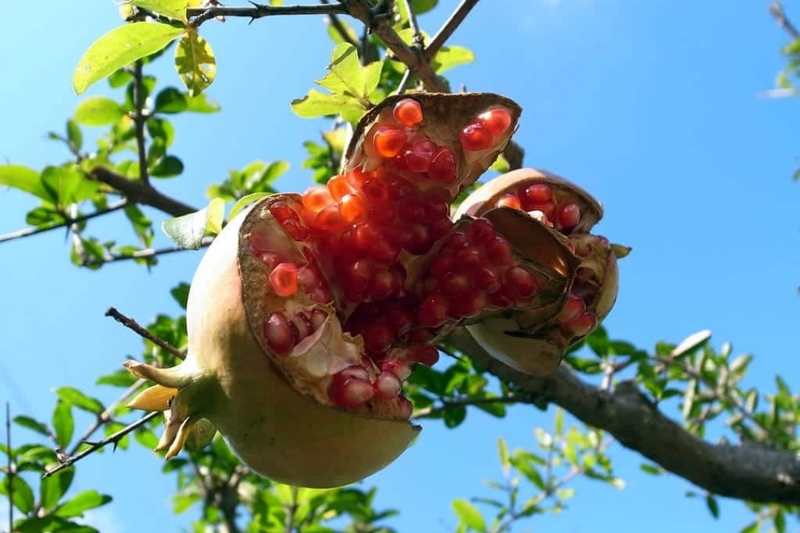 Punica granatum - The pomegranate - is a species in the Lythraceae family, native to northern inda and widely cultivated for its fruit. It is a shrub or small tree growing 5 to 10 m (16 to 33 ft) tall with spiny branches, opposite or subopposite, glossy, narrow oblong 3–7 cm (1.2–2.8 in) long leaves and bright re 3 cm (1.2 in) wide flowers. The fruit is in season in the Northern Hemisphere in the winter and in early spring and in the Southern Hemisphere. The pomegranate, Punica granatum, is a large shrub or small, rounded, upright tree with oblong, glossy leaves. The bloom occurs summer, red-orange, in funnel with five petals. The fruits reach 12 cm in diameter, are beige, spherical, edible, containing multiple red grains. In mild climate, it produces fruits - otherwise, it will give you a pretty bloom! Plant the pomegranate tree early in the fall to favor rooting before winter, and therecovery in the spring - avoid periods of frost. Plant in the spring for evergreen species. In all cases, prefer a very sunny place, hot in summer, in a draining, rich soil. Plant in a hole at least twice as big as the root ball. Soak the roots before planting, this will greatly improve the chances of recovery, regardless of the conditioning. You can form a bowl of earth around the trunk, which will be used for watering during the first months. Tamp the soil around the roots (do not hesitate to use all the weight of the body). Water copiously until filling the planting bowl. Mulch In pot, use a mixture of potting soil and loam. Protect the roots from cold winter bites, using a thick mulch that you should spread in November. Renew mulching in the spring to avoid weeding. Add an organic amendment in the fall, such as compost or decomposed manure. Water regularly in the first month, as soon as the soil is dry. In a pot, water once or twice a week during growth, and up to 3 times a month in the winter. Bring potted grenadiers inside if there is a risk of frost. Once the cold weather are passed due, gradually replace your pomegranate tree outside, in a very bright spot. Prune in winter, removing entangled branches, inward ones, damaged branches, and dead branches.